I never thought there would be a day when I would hop on the Path for dinner n Jersey City. But there we were, trekking through the quiet streets off of the Grove Street stop eagerly, in one of the numerous steadily falling snow storms of this winter nonetheless. 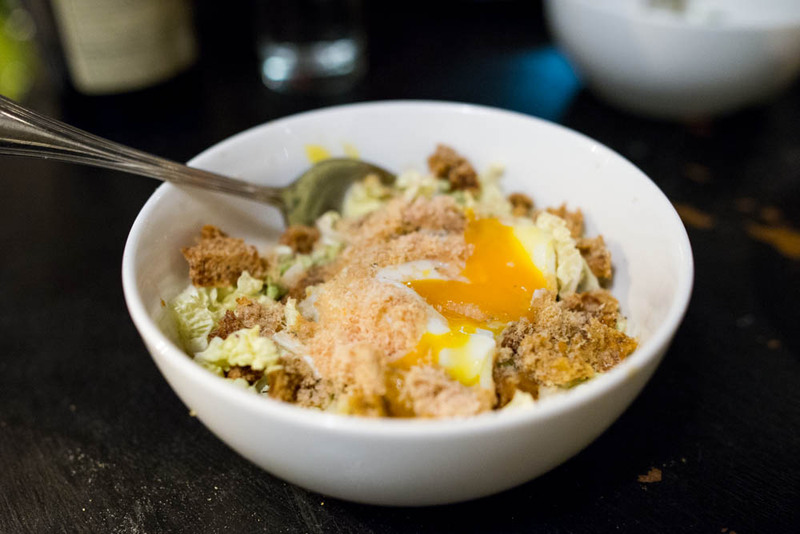 Our destination was Thirty Acres, a new hot spot in Jersey City with a former chef de cuisine from Momofuku Noodle Bar at its helm. Finally, after a brisk 15 minute walk which would have been shorter had we not gotten a little lost, we found Thirty Acres and ducked inside quickly. The four of us were seated by a bay window warmly lit by the street light. The restaurant was quiet with a handful of tables of patrons enjoying an early dinner but it was a rather snowy Sunday night after all. We were famished and didn’t waste much time debating what to order from the short menu that meandered all cuisines and continents for inspiration. 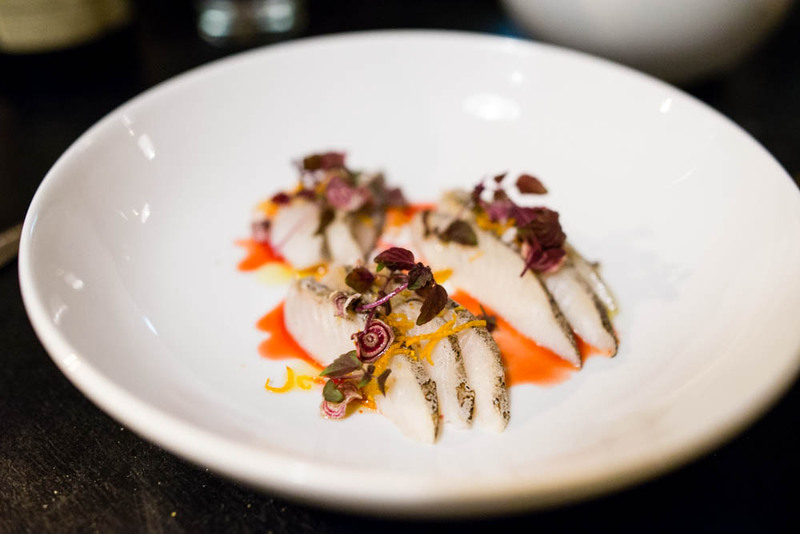 The starter section of the menu made up almost half of the dishes offered so we started there with a beautiful plate of kombu cured mackerel with blood orange, seven spice and beets. 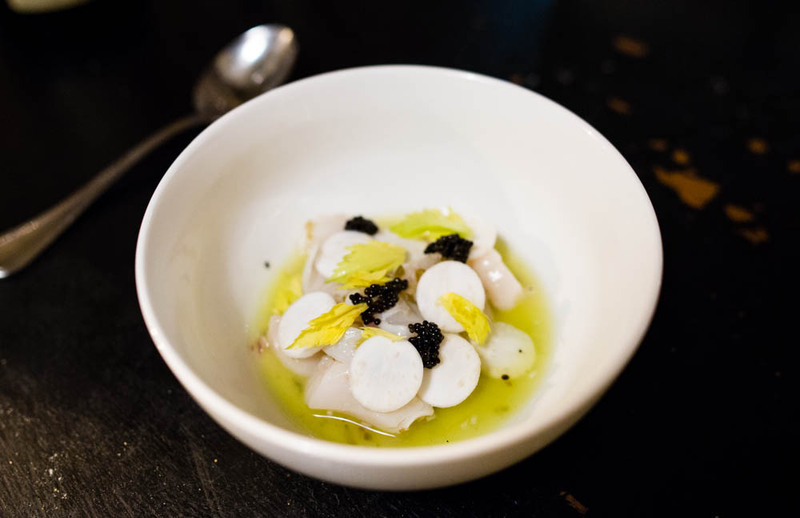 Followed by a bowl of scallop ceviche dressed with celery, serranos, and grinnel caviar. The spicy serrano peppers play off the sweetness of the scallop creating a dish that makes you pay attention. 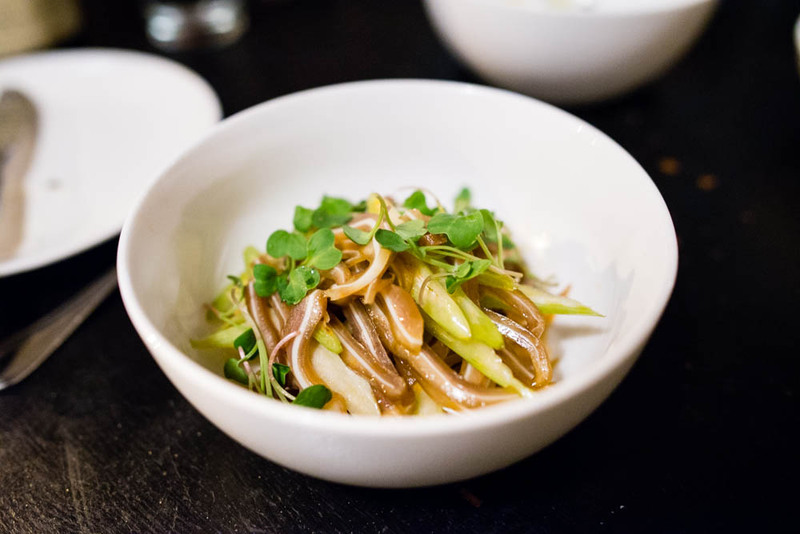 From the raw dishes we ventured into the offal section with the pig’s ear salad with chili oil and celery. I am so glad that I have such adventurous eaters as friends. Honestly, I don’t know that many others who would have let me order this let alone fight me for bites of this spicy salad. The next offal dish we ordered was a spicy bowl of tripe stew. 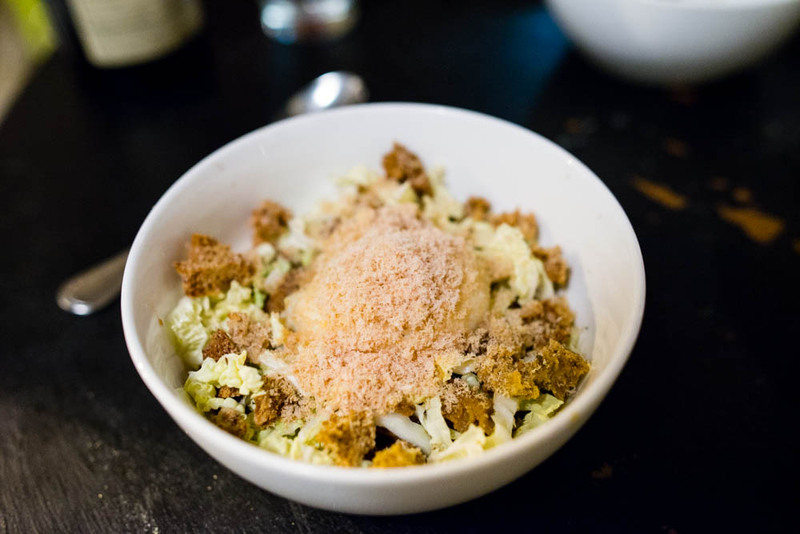 The tripe had been stewed into a tender delicious mess hidden beneath a bed of finely shredded napa cabbage, rye croutons, country ham and a soft poached egg. I could have been easily satisfied with a big bowl of this on the cold day and a piece of bread to grab every little bit of the sauce. Just to make sure we ate our vegetables, we added on an order of the roasted carrots. 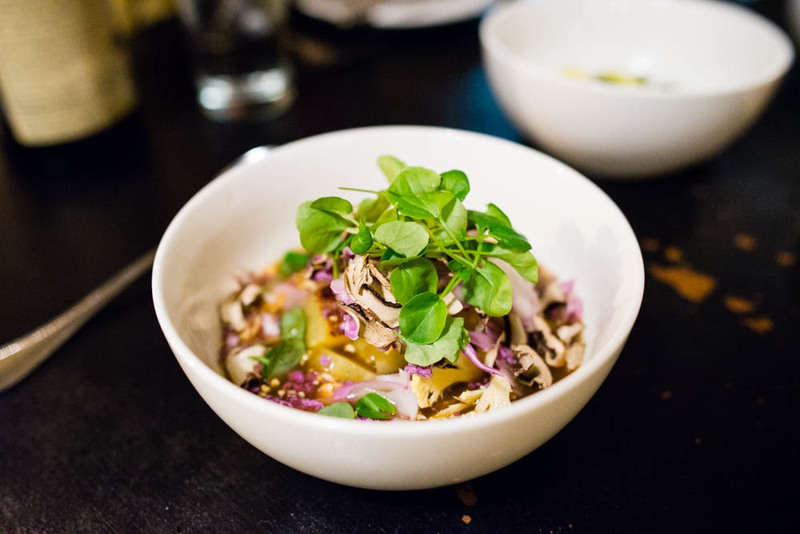 Served in a hot and sour broth, the sweet roasted carrots contrasted with the shaved cauliflower and tender watercress. Feeling like we have fully explored the smaller plates, we moved onto the pasta section. The menu included three and since we wanted to save some room for an entree, one had to be trimmed. With that, we were left with a bowl of tender fogli di pasta with earthy buttery trumpet mushrooms, thyme and a flurry of stravecchio. What was even better than a big bowl of buttery cheesy mushroom pasta? 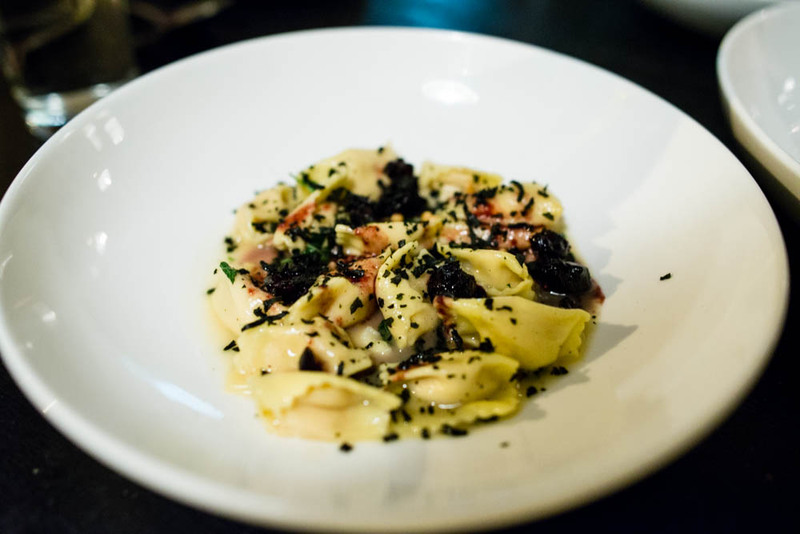 The delicate and rich agnolotti filled with chicken liver and ricotta in a cranberry, mint and wakame sauce of course. 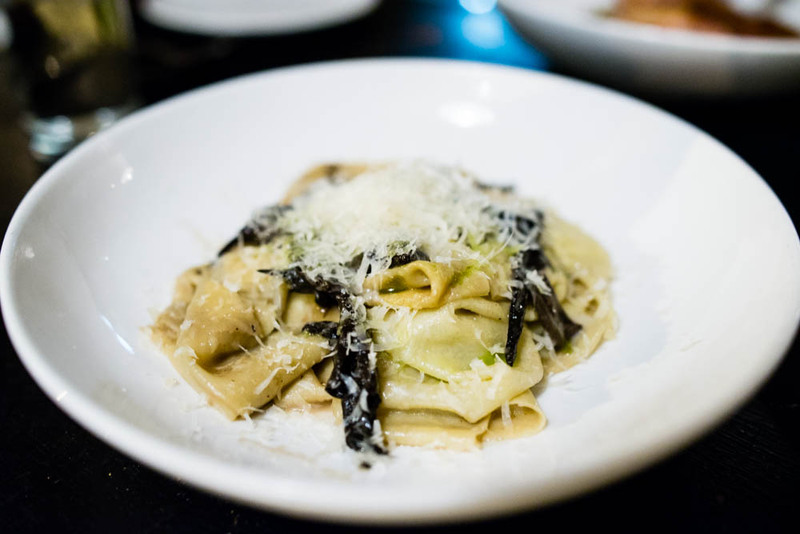 For someone who usually prefer spaghetti or linguine, I was won over by Thirty Acres’ chicken liver agnolotti heart and soul. Finally, our last savory course of the night. I normally would never order chicken as the only entree but Thirty Acres’ roasted chicken came so highly recommended that I could not ignore it. 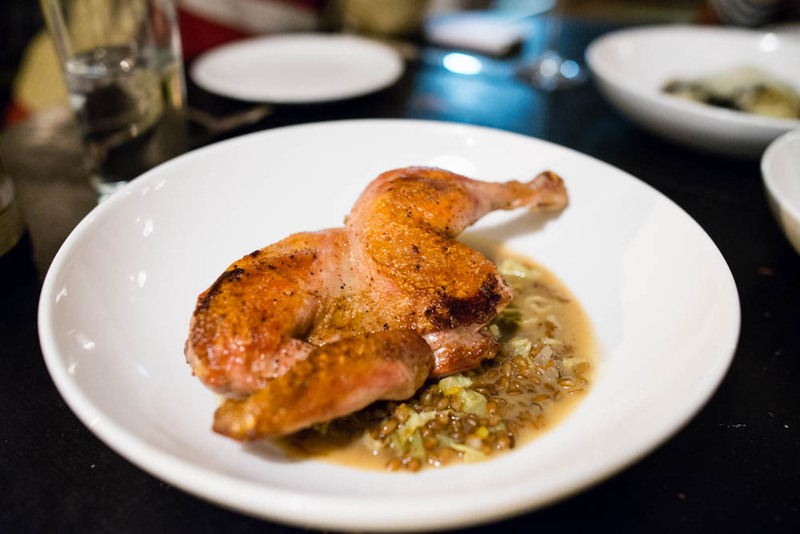 A half piece of perfectly roasted moist chicken with crispy skin came with a spicy lobster sauce and rye berries. Who would have thought to pair lobster sauce with chicken? The result is absolutely fabulous and had me scooping up every last bit of the rye berries which were soaked in the sauce. The dessert menu at Thirty Acres is short so we decided what the heck and ordered all three items since we were already indulging. The first on the list was Kevin’s Mom’s lemon bar. 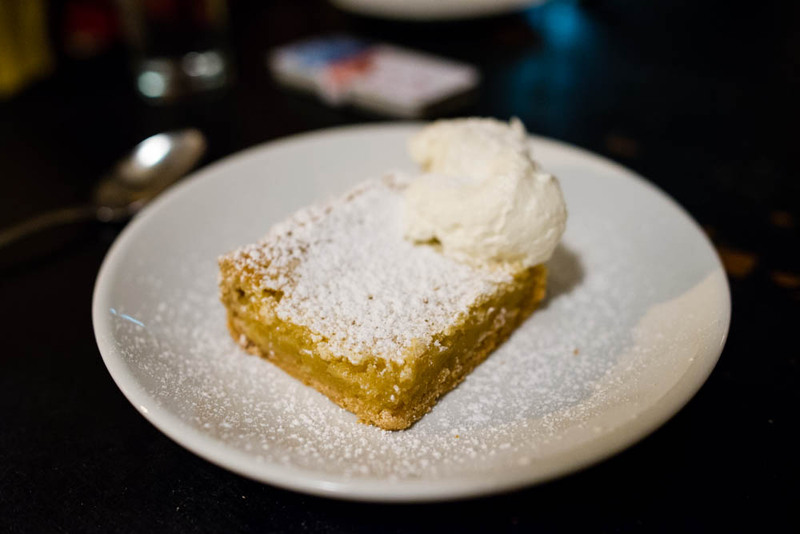 I don’t know who Kevin is but his Mom does make one deliciously tangy lemon bar. I love rice pudding of all kinds and the one here was no exception. 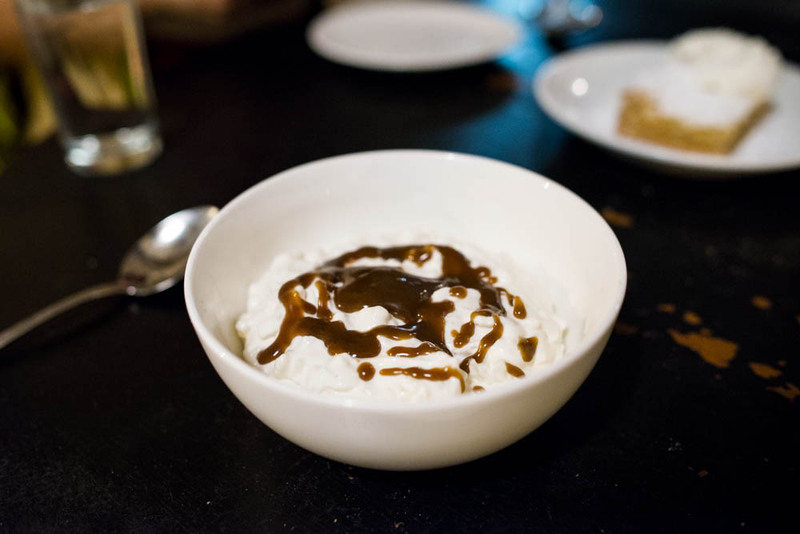 Served with a coffee salty caramel sauce, the rice pudding tasted almost as if the rice kernels were folded into a soft pillowy bowl of pudding. 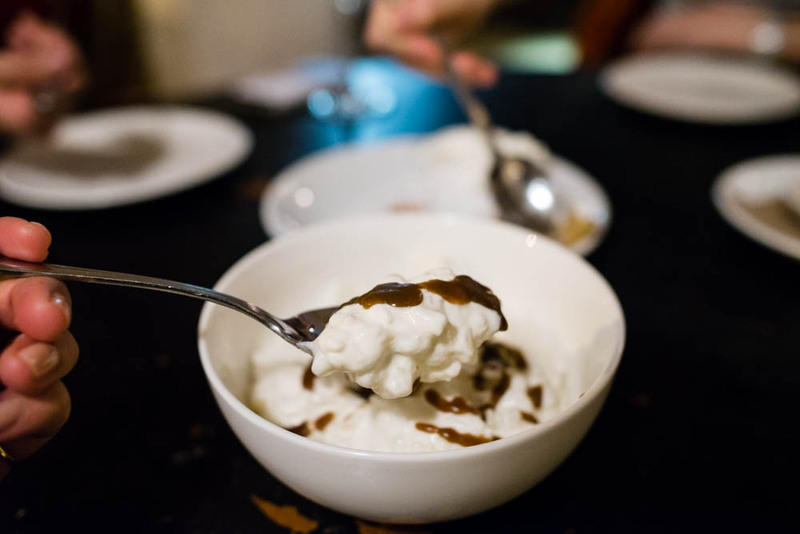 I loved how bitterness of the sauce cuts through the sweet rice pudding and how each kernel still retained a nice bite. And finally, the last dessert to grace our table was a lovely apple cake that came highly recommended by our waitress. The warm cake was drizzled with a delicious walnut maple syrup that sunk deep into the crumbs making it unbelievably moist. 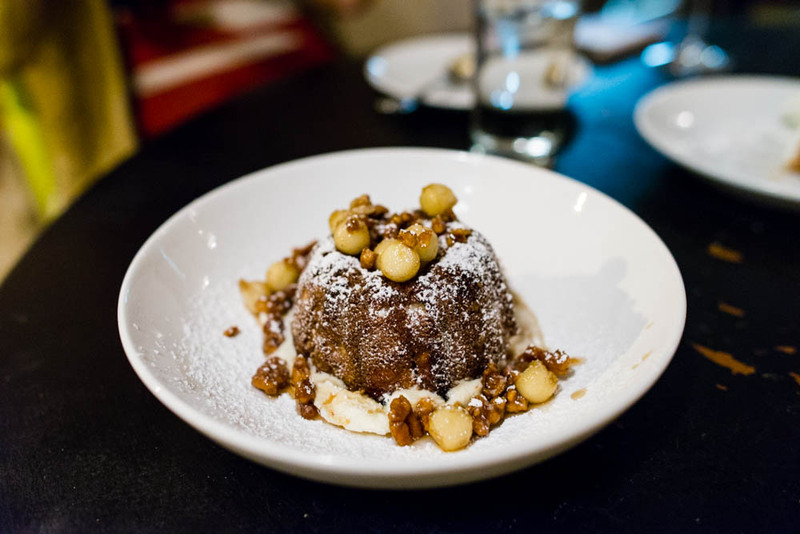 Topped with crunchy walnuts and little tiny pearls of apple, cake was made even more lovely by the whipped mascarpone. By the time we devoured all three of our desserts, we were plenty full and quite happy might I add. The meal had been so charming and unique that I could have sworn that we were in the heart of Manhattan instead of in Jersey City. That illusion unfortunately disappeared when we ventured outside onto the streets that are now fully coated with fresh snow making our way to the Path. Despite the slight commute, I was happy to find a restaurant worthy of the short ride on the Path on the other side of the Hudson. After all, a little adventure never hurts anyone, especially not when there is such delicious creations awaiting at the end of it.